London South Bank University (LSBU)’s Digital Architecture Robotics Lab (DARLab) is currently being featured at the Internet of Things UK Showcase at the Digital Catapult Centre in London. 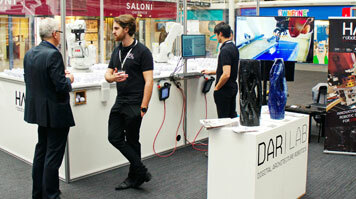 DARLab is an advanced digital manufacturing robotic lab in LSBU’s School of The Built Environment and Architecture designed for high-quality research, as well as developing commercial applications for architecture. The exhibition features DARLab’s collaboration with HAL Robotics – a leading robot control specialist firm – and details its experimentation with new design, prototyping and construction techniques. The showcase presents the latest in digital technology to industry leaders, researchers and other innovators. The Internet of Things UK Showcase runs until the end of March at the Digital Catapult Centre – a neutral, not-for-profit organisation, whose work aims to accelerate economic growth and productivity across a wide range of UK sectors. Find out more about enterprise and business engagement in LSBU's School of The Built Environment and Architecture.